What is it that draws millions of people to this 43 square miles of former swamp land in central Florida each year??? 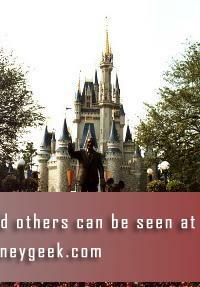 Well its hard to explain, but I have put together these pages in an attempt to show people what it is that makes Disney World the leading tourist destination in the world. The Theme Parks - Covers the four major WDW theme parks. The Magic Kingdom, EPCOT, the Disney's Hollywood Studios, and Disney's Animal Kingdom. The Resorts - The Walt Disney World Resort has several resorts for you to choose from in various locations around the property and in several price categories. As of 2017 there are 36 resort hotels (26 owned and operated by Walt Disney World, includes nine Disney Vacation Club resort properties), 30,000 hotel rooms; 3,293 DVC units; 799 campsites, 600,000 square feet of conference space. Recreation - You can choose from Golfing, Fishing, Water parks, Tours, or other outdoor activities on your vacation. Dining - WDW has some of the best restaurants you will ever visit. We talk about a few here. Planning - Some tips on how to prepare and get the most out of your vacation. Other - Some other topics to think about... like WDW at the holidays or the Disney Cruise line.